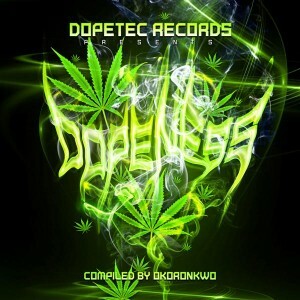 Dopeness is the debut compilation from Dopetec Records, Germany, here to bring you fast and crazy music from the hi-tech end of the psytrance spectrum. For this initial foray into the world of hyperkinetic dance music Okoronkwo has selected a number of tunes from established and upcoming talents from around the globe. Mastered by Anomalistic Studios, with design by Wastage. MP3 Download | FLAC Download | WAV Download · Download count: 13,778. I’m so pumped.. incredible selection. Muito bom o som.. Parabéns…. thanks to all this is amazing!!!! Track 4 => file not found. Man, I’ve really been digging this Hi-Tech stuff. At first, I thought “oh great more generic psycore” but now I am noticing a huge difference in the two genres… Psycore seems to focus on darker, absurd elements (CinderVOMIT for the win) while Hi-Tech goes off into the more Dance Floor acceptable, nuttier head-banging-rage direction. The two Hi-Tech releases this week are top-shape and massive. Suddenly I find myself with 40+ Hi-Tech songs when I just discovered the genre this week! Thanks Dopetec. Weird, I can’t download this using KGet manager, but it downloads in browser… + track for is missing in previews. A rather inconsistent selection of tunes ranging from ‘hell yeah’ to ‘meh’. This would have been better if it was cut down to 10-12 tracks to keep the quality and flow as strong as possible. The set has been online since august! I found the latest Jellyfish Frequency hi tech compilations to play more fluently and coherently. Lots of sloppy messing around and grating sampling on this album, not much flow to the bludgeoning. I did really like Skup “Fat Spiders”. me thinks Anomalistic’s mastering is too harsh and compressed! Stabbing the ears, ouch.